Pervez Bilgrami (پرویز بلگرامی) (b. 1962 is an Urdu story writer and Novelist from Karachi, Pakistan. He has been an Editor of Monthly Digest Sachi Kahanian (سچی کہانیاں) for last 20 years. He currently works as an Editor for Monthly Sargazusht (سرگزشت). 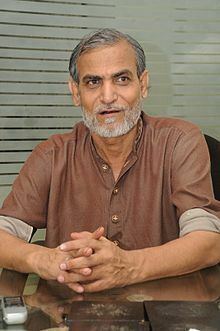 He is a professional Urdu novelist and story writer. He has written with many pen names and wrote thousands of stories. At the start of his career he used to write 120 pages of a digest at the demand of readers per month. His more than 6000 stories have been published. Many stories were printed with his pen names. He has 28 published novels. Most of the Novels were best sellers of the year. Dosra Janam (دوسرا جنم), ', Tareekh-e-Khandhar(تاریک کھنڈر), Mataa-e-Dil-o-Jaan(متاع دل و جاں), Masiha(مسیحا), Shaheen Sifat(شاہین صفت) are some of his most well known novels. Most of his work is available on Internet. He has been awarded the "Dosheza Writer Award" two times in last ten years. His latest interview was published in a local newspaper Daily Express on 12 June 2012. Bilgrami was born in 1962 . His father's name was Mazhar Ali known as a Johar Bilgrami. He was a poet and a literary personality but was well known as a movie director. Bilgrami's grandfather, Allama Mehmood Hasan Mujtahid was a religious scholar and Johar Bilgrami was brought up in a strict religious atmosphere, and joined the film industry later. Johar Bilgrami met with Raja Mehdi Ali Khan in a party at the age of 18 and this meeting helped him enter the film industry. Johar Bilgrami went to Mumbai with Raja Mehdi Ali Khan and later he spent his life in pakistan. Johar Bilgrami's films include Aadhi Raat, Gharoni Jhurr and Drao. Pervez Bilgrami was a good footballer in his early days. He got the habit of studying novels from his father, who had a great collection of pulp fiction books. Pervez Bilgrami read Or Talwaar Toot Gaye – And Sword Broken Down the thickest novel of Naseem Hijazi when he was a student of 2nd grade. After reading that novel Bilgrami became spent a lot of time in his father's library reading books, stories and novels. After reading many books Bilgrami started writing short stories and his first story which was published in a daily newspaper when he was only 7 years old. This publication gave strength to his writing skills and he got many rewards and appreciations from whole family and relatives including his father. His father arranged a story writing contest between him and his sister. Pervez Bilgrami wrote a story Ek Teer Do Shikar – Two Birds One Stone for the contest. At the age of 16 Bilgrami started writing short stories for the kids page of Urdu Jang Newspaper. In 1969 Bilgrami went to West Pakistan with his father, where his father announced a new movie Thandi Aag – Cold fire, but his father couldn't complete the movie due to the situation of the country and his family had to travel to Karachi. In 1972 Bilgrami's father died. Pervez Bilgrami started a small business, some jobs, stalling in Friday Markets. However he missed writing and again started writing stories. His many stories were published in a well known story book Sachi Kahanian – True Stories. In 1990 he joined Sachi Kahaniya'n (Dosheeza Group of Publication) as a sub-editor and became the editor of Sachi Kahanian in 1994. He worked for 18 years at "Sachi Kahanian". He started writing the novel Ghazi for Sachi Kahanian in early days of his job in the form of serial. After capturing the readers for many years Ghazi was published in a form of book and became the best seller novel of the year. In July 2008 Pervez Bilgrami left the editorship of Sachi Kahanian and joined Sarguzasht (Jasoosi Group of Publication) as an editor and he has been working with Sarguzasht for last four years. Most of his novels are published in the form of books. Ghazi, Dosra Janam, Tareekh-e-Khandhar, Mataa-e-Dil-o-Jaan, Masiha, Shaheen Sifat and Muqadas Taboot are best sellers. He won "Dosheza Writer Award" two times in last the ten years, which proves his popularity and reader ship of his novels and stories. Pervez Bilgrami is the only writer from Pakistan who writes mini stories. Mini stories term is used for the stories which consist of one page and are known as "Mini Kahani" or Short Story. He has written more than 150 mini stories which are uploaded on many social websites and Urdu forum. Pervez Bilgrami wrote many thrillers, mysteries, horror, romantic and historical novels and short stories but now he has started writing horror re-enactment for Dawn News TV. 6 Episodes have been broadcast by Dawn TV and video are available at YouTube.com. Horror re-enactment is accomplished through the use of scary super natural elements and true stories. Pervez Bilgrami got many awards in his life from respected literary personalities. In 2003 Pervez Bilgrami was awarded as a Best writer by Interior Minister of Pakistan General Moinuddin Haider. He also won the "Doshiza writer award" from Sachi Kahaniya'n Doshiza Group of Publications. Most of the literature, stories and novels by Pervez Bilgrami are available on internet. Some websites like, Urdudost.com, urduyouthforum.org, novelpk.com, kitaabghar.net, kitaabghar.com, urdukorner.com and friendskorner.com etc. updates the content written by Pervez Bilgrami on the websites. He loves poetry and says some verses and small poems time to time. He was married in 1993, and has two sons and one daughter. Tareek Khandher – Horror Novel. Doosra Janam – Thrill Novel. Dast-e-Aalam Mei'n – Thrill Novel. Aami k – Horror Novel. Mi Aied – Horror Novel. Nadida Mahboob – Horror Novel. Manzile'n Gardish Mei'n – Thrill Novel. Masiha – Horror Romance Novel.